Christmas and New Years have come and gone. All the gifts have been unwrapped, the parties are a memory and the last of the fruit cake has been eaten. Your therapists have come back from vacations and school has resumed. Give me a high five, you made it! While there were many wonderful moments that I am sure you never want to forget. I know it wasn’t without its challenges. Now you can resume those precious routines until the next big thing. But before you dive in, take a moment to just breathe. I mean it. Take a moment right now to close your eyes, let the tension melt out of your shoulders, relax your muscles and follow the following 4 steps. 1. Take a deep, slow breath from your belly, and silently count to 4 as you breathe in. 2. Hold your breath, and silently count from 1 to 7. 3. 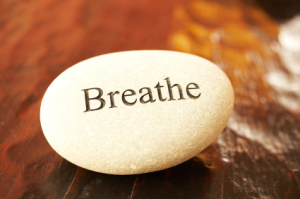 Breathe out completely as you silently count from 1 to 8. Try to get all the air out of your lungs by the time you count to 8. 4. Repeat 3 to 7 times. It is easy to always focus on what needs to happen next and always be in go mode. The stress compounding the way we wish our bank accounts would, affecting our physical, emotional, and spiritual health. Taking a toll on the relationships we have and leaving us depleted and unable to take one more step. So as you feel that stress mounting, and you are getting ready to dive into the next thing just take a moment and remember to breathe.